Last week we reviewed the Intel Core i5-655K, which was one of two multiplier-unlocked CPUs recently released by Intel. Today we’re focusing on its bigger brother - the LGA1156 Intel Core i7-875K. As with the i5-655K, the i7-875K is very closely related to one of Intel’s current CPUs, namely the Core i7-870. The i7-875K shares the same stock speed of 2.93GHz (with a max turbo frequency of 3.6GHz) and the same 8MB of L3 cache as the old i7-870. The two processors also support Hyper-Threading, meaning that Windows sees the chips as having a mighty eight execution threads, though four of these are only logical cores created from the spare resources of the four physical cores. In actual fact the only physical difference between the two CPUs is the i7-875K’s unlocked multiplier which, as we covered in the i5-655K review, allows an extra degree of freedom when overclocking the CPU. This can be an advantage if you’ve reached the Base Clock limit of your motherboard, as you can then turn to the multiplier to push the CPU further. 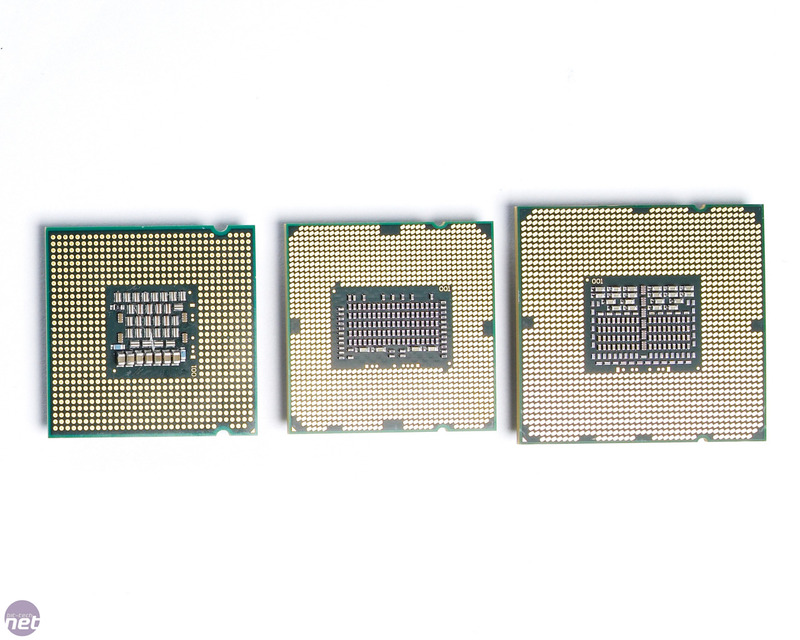 The i7-875K (centre) is smaller than the LGA1366 i7-930 (right) but bigger than an old LGA775 Core 2 chip (left). Click to enlarge. Having said this, a decent LGA1156 motherboard should be able to run with a Base Clock of 200MHz, which should be able to push most Core i-series CPUs to their limit due to their high multipliers. We certainly found this with the i5-655K, and can’t help feeling that the story could be the same with the i7-875K too. We also prefer to use the Base Clock rather than the CPU multiplier when overclocking CPUs. Increasing the Base Clock increases the amount of bandwidth between the CPU and the rest of the system, yielding greater performance for the same overall CPU frequency. This has the effect of making the i7-875K look like a bargain, but in reality it’s more true to say that the i7-870 is incredibly bad value for money. We find it hard to understand why the LGA1156 Core i7 range even exists, as a low-end LGA1366 processor will usually provide more performance for less cash, and this CPU (especially in light of its price) sheds no light on Intel's rationale. At £282, the i7-875K is pitched squarely at AMD's flagship Phenom II X6 1090T Black Edition CPU, which costs £233, and the excellent i7-930, which is a little cheaper at £228. The two K series chips both have unlocked multipliers. Click to enlarge. Again, we wanted to find out whether or not the fully unlocked multiplier of the i7-875K would give us more overclocking potential, but we came up against the same problem as with the i5-655K. The i7-875K isn't overclockable enough for an unlocked multiplier to be of any use. We hit the 4.2GHz maximum of the chip by leaving the stock multiplier at 22x and bumping up the Base Clock to 191MHz, which is well below the limits of our motherboard. To do this, we used a vcore of 1.35V, a QPI/VTT of 1.2V and a CPU PLL of 1.9V. We also needed to change the memory strap to 8x to ensure that our memory ran at 1,600MHz. Having said this the 22x multiplier of the i7-875K is lower than the 25x multiplier of the i5-655K, meaning you're likely to reach the Base Clock limit of your motherboard sooner with the i7-875K than with the i5-655K. This is especially true if you're planning to use water- or phase-change-cooling. If you're not using exotic cooling (and why would you on what is, after all, a mid-range CPU) then the default multiplier of 22x and the 220MHz maximum Base Clock that the best LGA1156 boards are capable of gives you a maximum potential overclock of 4.84GHz before having to touch the multiplier. This is a huge overclock that only the best overclockers and sub-zero cooling systems will achieve. 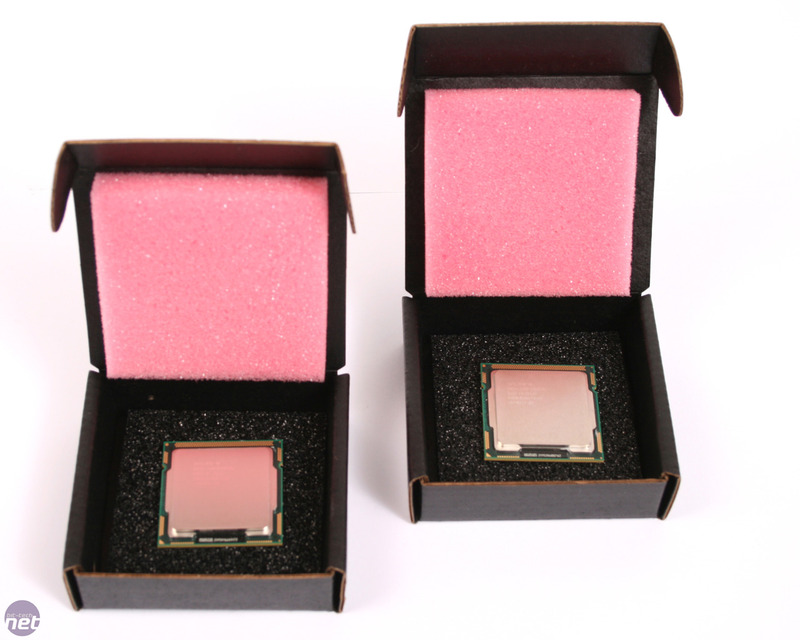 AMD has unveiled a pair of new Phenom II chips - the X6 1075 and the X2 560 Black Edition. AMD has announced that its MMX rival, 3DNow!, will not appear in future processors. We've learnt Intel's upcoming Sandy Bridge CPUs might have some serious OC issues.